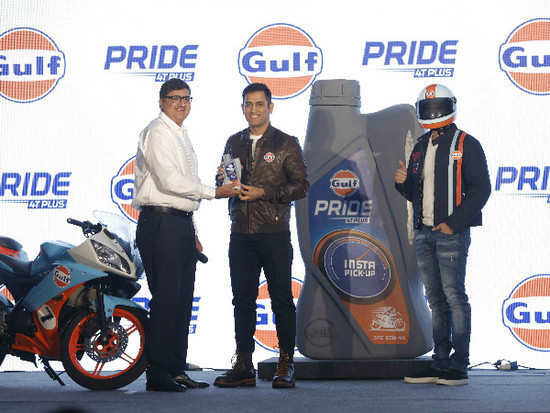 Fresh after winning the Indian Premier League 2018, Captain Cool, MS Dhoni was in Mumbai for the re-launch of Gulf Pride 4T Plus, a high performance motorcycle engine oil from Gulf Oil Lubricants. An ardent biker himself, Dhoni headlined the event, attended by more than 300 of the company’s retailers and aftermarket partners. The cricket icon , who is also the brand ambassador of Gulf Oil Lubricants shared a few moments of insight with the Managing Director of Gulf Oil India, Mr. Ravi Chawla on the sidelines, even as he posed with the vibrant and trendy pack of the re-launched Pride 4T plus. Gulf Pride 4T Plus, a premium 4-stroke motorcycle engine oil is the first choice for many bike-owners, since it is superior in quality and facilitates instant pick up. Alia Bhatt just received a 'welcome to the family gift' from Ranbir Kapoor's sister! 8Nick Jonas' comment on Priyanka Chopra's Instagram post has sent fans into a frenzy! 10Alia Bhatt just received a 'welcome to the family gift' from Ranbir Kapoor's sister!